Avro Vulcan XH560. Copyright The Cockpit Collection. 29/5/61: Allotted for Skybolt development. 26/9/62: 12 Sqn. RAF Coningsby. 23/8/65: RAF Cottesmore Wing (9/12/35 Sqns). 10/4/67: RAF Waddington Wing. (44/50/101 Sqns). 2/2/68: RAF Cottesmore Wing (9/12/35 Sqns). 28/6/67: RAF Cottesmore Wing (9/35 Sqns). 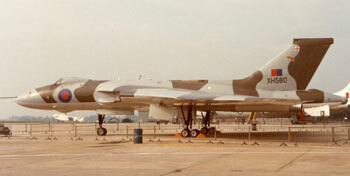 20/11/71: Hawker Siddeley Bitteswell for storage. 1/2/73: Conversion to B2 (MRR) role. 25/3/82: RAF Waddington (9/44/50/101 Sqns). 5/7/82: British Aerospace conversion to K2. 24/8/82: RAF Waddington (44/50 Sqns). 1/4/84: Station Flight RAF Waddington. 29/8/84: Station Flight RAF Marham. 5/1/85: Struck off charge. Cat 5(c). Nose section removed for restoration and loaned to RAF Marham for display by The Cockpit Collection. 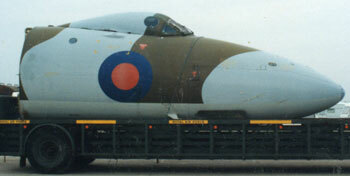 Anything relating to the Vulcan B2/K2 that will help us in this restoration, including Instruments, morse key, refuelling probe and nozzle, Red Steer box for rear desk, Abandon Aircraft warning for rear desk, RAT release handle for pilot's coaming, flight refuelling indicator for co-pilot's side console, throttle box, squadron patches, Vulcan Pilot's notes, aircrew equipment and flying clothing, photographs or videos of XH560 in service. The following photographs have kindly been sent to us by Pat Henderson (USN-Ret) and were taken by him at NAS Midway between the 2nd and 10th February 1976. They show XH560 and XH534 in the background. We wonder if anybody might know the reason for their visit, were they on an exercise? Looks like XH534 might be undergoing some form of maintenance, possibly inspecting for the presence of the indigenous "goony bird" that inhabits the island and will nest anywhere! I was looking at the pictures of the two 27 Sqn B.Mk 2 (MRR) aircraft at Midway and I think I can give you and answer to why they were there. As you may be aware, as well as the MRR role, the 27 Sqn aircraft also had another purpose in life, namely 'sniffing' for information after a nuclear test, hence the underwing pods. From my memory, unless I am mistaken, around 1976, the French were carrying out nuclear weapons testing at Noumea. Given the proximity of Midway, plus the presence of the pods, this may be a likely explanation. All photographs courtesy of Pat Henderson (USN-Ret).